Tony Mims speaks at the unveiling of the Little Texas historical marker at the Bon Secours Wellness Arena in Greenville SC during the Little Texas Reunion on August 12, 2017. 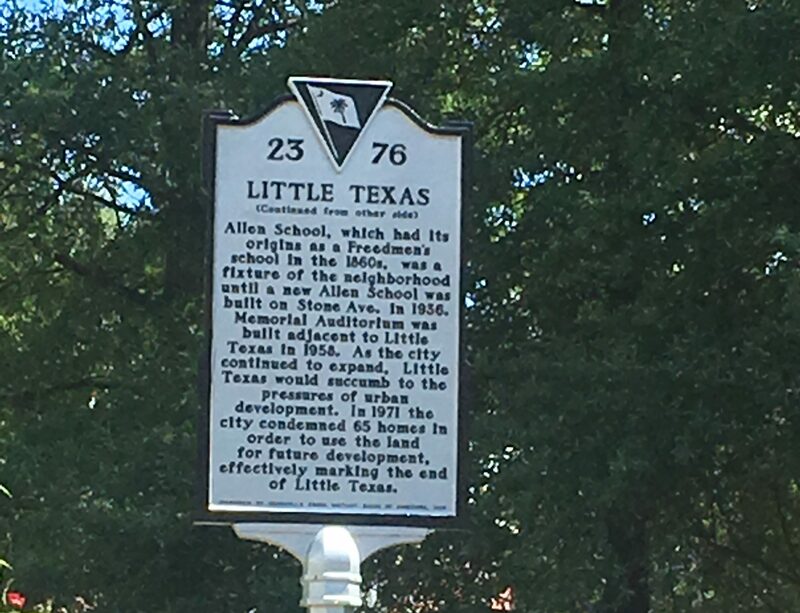 The newly installed historical marker for the black neighborhood of Little Texas. Bon Secours Wellness Arena, Greenville, SC. you won’t respect your future. of your own personal confusion. should be a force of the positive and the strong. in a world that sometimes gives life very little meaning. The history of Little Texas goes way back. was Greenville’s first black working class community. The neighborhood was originally built around Allen School. Black men had built it on the other side of town. and they rebuilt it on these sacred grounds. Black families moved near the school, seeking a better life. They knew that education would help their children to succeed. based on their educational needs. And this black community grew strong. This is the legend of how Little Texas got its name. that gave this black neighborhood its fame. With no jobs, no money, the neighborhood changed. whoring houses, Little Texas was a major player in the game. and the people got tough. They had to protect their home and they didn’t take no mess. It was like living in the Wild Wild West. the Little Texas neighborhood was redefined. Black families started to move back in. They were buying their houses and land. in spite of being economically and socially deprived. This black community grew strong and thrived. There wasn’t any federal assistance or Welfare. The neighborhood took care of its own. Somebody had to care because the system wasn’t fair. and even the radio, and then the TV. People slept with their windows and doors open. There were no worries over someone breaking in. This was a black neighborhood of family and friends. In 1970 our neighborhood came to an end. Friends and families had to disband. I experienced lost memories, lost tears. but we didn’t lose our community. Today we stand strong honoring our past and history. Over the years we kept what we had shared together alive. the Little Texas Community will always survive. because we put Little Texas back on the map.